December 15, 2015 - U.S. Sen. Jim Inhofe, member of the Senate General Aviation Caucus and certified flight instructor with more than 11,000 flight hours, today hailed the Senate’s unanimous passage of the Pilot’s Bill of Rights 2 (S. 571). The bill has 70 cosponsors, including U.S. Sen. Joe Manchin. “This is a big victory for general aviation pilots all across the country,” said Inhofe". The bill has been sent over to the House for consideration. “The Pilot’s Bill of Rights 2 addresses many of the concerns these pilots have brought to my attention first hand at events like‎ Airventure each year held in Oshkosh, Wisconsin since the first Pilot’s Bill of Rights was signed into law in 2012. "Currently, the FAA’s medical certification process is bureaucratic, burdensome and discourages pilots from disclosing and treating medical conditions that could impact their ability to fly. This legislation reforms the medical certification process for general aviation pilots in a way that will increase pilots’ knowledge of risk while demanding treatment of identified conditions. Reforms the FAA’s medical certification process by expanding an existing FAA medical standard to include more qualified, trained, general aviation pilots. 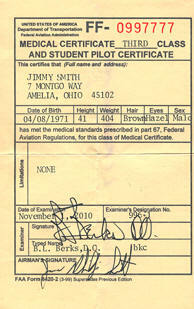 Outlines specific requirements that pilots need to meet to qualify for the expanded medical standard, including completion of a medical education course every two years, self-certification by the pilot that they are being treated by their physician for any medical diagnosis that could impact their ability to fly, and the use of a checklist to guide the discussion between pilots and their physicians during a health examination, which must occur once every four years. Enhances the due process rights established in the first Pilot’s Bill of Rights by ensuring airman have the right to appeal an FAA decision through a new, merit-based trial in Federal Court. Increases transparency for airman subject to an investigation or enforcement action by requiring the FAA to articulate the specific activity under investigation to parties involved in the investigation and provides specific documentation relevant to its investigation. Expedites updates to the Notice to Airmen (NOTAM) Improvement Program required in the first Pilot’s Bill of Rights and directs the FAA to include the effective duration of temporary flight restrictions in NOTAMs. This ensures the most relevant and important information reaches the pilot prior to a flight taking place. The legislation also mandates that the FAA certify the accuracy of posted NOTAMs. Ensures the accessibility of flight data, such as air traffic communication tapes and radar information produced by contract towers, and flight service stations and controller training programs, which gives certificate holders the ability to use this information to defend themselves during an enforcement action proceeding. Background - On Aug. 3, 2012, Inhofe’s Pilot’s Bill of Rights (S.1335) was signed into law, which made FAA enforcement proceedings and NTSB review fair for pilots; streamlined the NOTAM Improvement Program; and required a GAO review of the FAA’s medical certification process and forms in order to help bring clarity and reduce instances of misinterpretation with medical forms for pilots. On June 30, 2014, Sen. Inhofe announced the development of the Pilot’s Bill of Rights 2 with the release of a discussion draft of the legislation. Over 400 comments were submitted from around the country about how to improve different components of the bill. On Feb. 26, Inhofe introduced the Pilot’s Bill of Rights 2, legislation that would reform the third class medical certification for recreational pilots and broaden the protections provided in the original Pilot’s Bill of Rights authored by Inhofe and signed into law in 2012. On Dec. 9, the Senate Commerce Committee reported S. 571 as amended to the Senate by a voice vote.